← WILL CHRYSLER WORKERS VOTE CONTRACT DOWN A SECOND TIME? 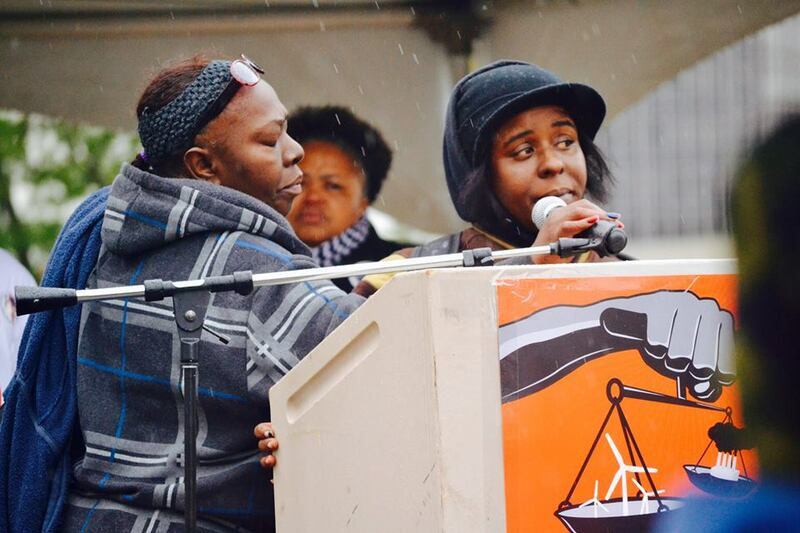 DETROIT – Kimberly Griffin of Detroit will be among hundreds traveling to New York City this week-end to protest the deaths of their loved ones at the hands of law enforcement, during #RiseUpOctober events Oct. 22-24. She and Mertilla Jones, whose granddaughter Aiyana Jones, 7, was killed by Detroit police May 16, 2010, left together Oct. 20. Kevin Kellom, father of Terrance Kellom, killed by police in Detroit April 27, was also going, Griffin told VOD. 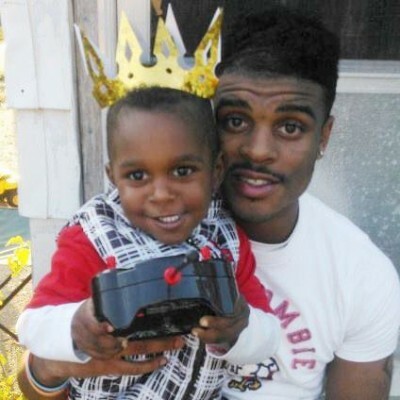 Mrs. Griffin’s son Kimoni Calvon “Kodak” Davis, 19, died June 29, 2015, a day after a 20-mile high-speed police chase on US 52 in Ohio, initiated by Damon J. Caruso, 24, a Hanging Rock Village, Ohio cop who has conducted four such chases. Davis had a young son who will not grow up under his dad’s protection either. 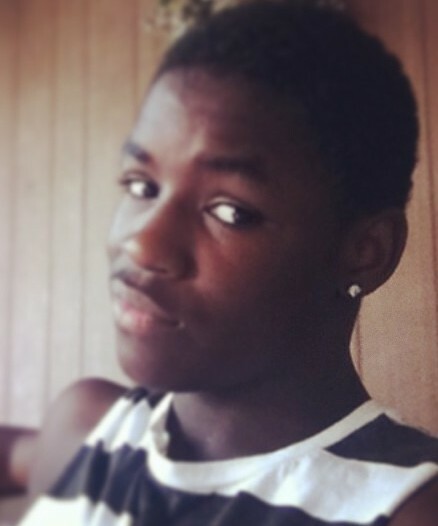 Airshaan Warren of Nitro, VA, 17, a passenger in the car, also died in the chase, his body cruelly crumpled after the car allegedly became airborne and flew down a steep embankment outside Chesapeake, Ohio. Davis died the next day in a Virginia hospital. However, she said, Warren ran away from home due to threats from a gang at his school. 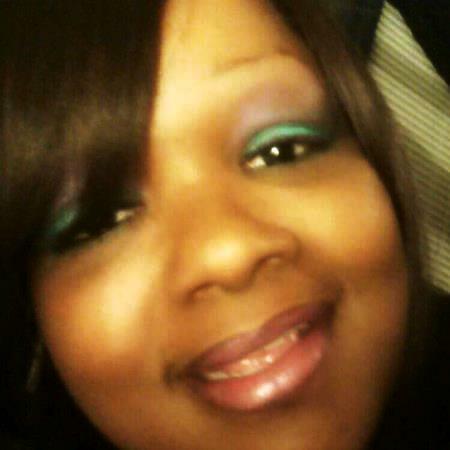 She said she stays in contact with Davis’ mother Kimberly Griffin. Caruso said in his report that he started chasing Davis and Warren because they were traveling 77 mph in a 60 mph zone. Airshaan Warren, 17, dead in Ohio chase. Hanging Rock Village, just west of the Ohio/W. Virginia state line, is nationally known as a speed trap where motorists are arrested and taken before a local “mayor’s court” instead of just being ticketed. Hanging Rock’s population is 221, 98.6 percent white. No drugs or weapons were found in the car or at the scene, and there were no warrants outstanding for the two youths, according to police reports. “Kimoni was not a drug dealer, thug, or a menace to society, he didn’t have a record!” Patricia Edison said on the “Voice for Kimoni” Facebook page, which has 630 supporters. 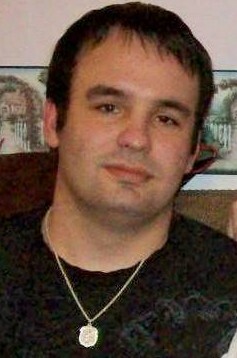 Hanging Rock Village cop Damon Caruso, 24 (Facebook). Caruso claimed that he never came closer to the car than 100 ft., and was pursuing it at 80-90 mph to try to get its license plate number, solely because it was exceeding the speed limit by 17 miles. 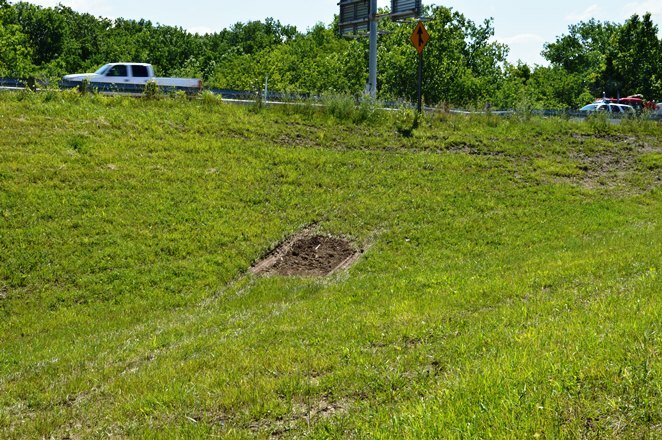 Photos obtained from the Ohio State Highway Patrol tell a different story, showing TWO SETS of tire tracks going up the embankment next to the ramp, raising the possibility that Caruso hit Davis’ car during the pursuit, sending it out of control and airborne. Ohio Highway patrol investigators reported that no drugs or weapons were found in or around the car, which landed in a thickly wooded area after, incredibly, flying over four lanes of traffic and dropping over a steep embankment on the other side. 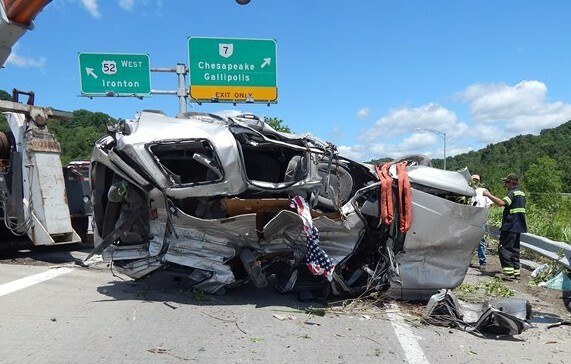 “When we arrived on the scene, we could not identify the front of the vehicle from the back of the vehicle,” Chesapeake, Ohio Fire Chief Ed Webb told WSAV TV of Charleston, W. Virginia on the day of the crash (video at top of story). The station reported that Warren was dead at the scene, but that Davis was taken to St. Mary’s Hospital in Huntington, W. VA. He died the next day, in his mother’s arms. 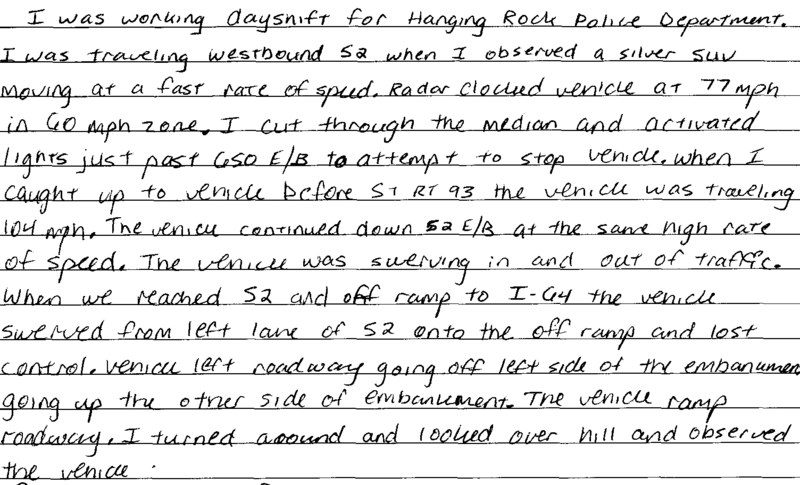 The Highway Patrol report (at Kimoni Davis full OHP crash report) adds details that are not in Caruso’s version, including the assertion that the car went airborne. Rectangular dirt “gouge” in embankment from which Davis car allegedly went airborne. OHP photo. VOD obtained a CD of numerous photos of the scene taken immediately after the crash from the Ohio State Highway Patrol. One shows a perfectly rectangular plot of dirt in the grassy embankment, which is called a “gouge” in the report. The report says that this was the point from which the car went airborne, although the area appears relatively level. Two sets of tire tracks leading up embankment. Was one made by Caruso car? OHP photo. It is unclear how such a perfect rectangle of dirt could have been produced by the chase, unless it was raked over afterwards in a cover-up. A photo taken from the top of the guardrail looking downward toward the rectangle shows TWO sets of tire tracks in the grass leading up to it. Did Caruso’s car actually hit Davis’ car, causing it to go airborne? 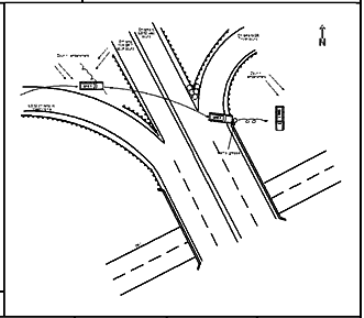 OHP map shows Davis vehicle flying over four lanes of highway traffic before landing down a steep drop-off at right. In fact, South Point, Ohio police officers who joined the chase reported that they stopped their pursuit due to its dangerously high rate of speed. Officers from Coal Grove, Ohio continued, following Caruso’s lead. Caruso is on a football team in that town. State troopers arrived at the scene shortly after the crash. Caruso was allegedly put on administrative leave after the crash. 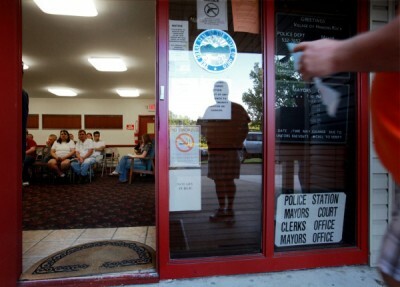 VOD left a message with the Hanging Rock Village city office inquiring whether he has returned to active duty, but received no response before press time. That office includes the police department, the court, and other administrative units. 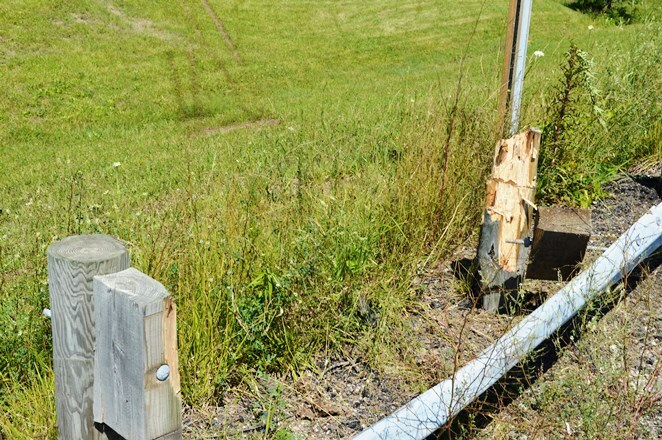 However, dash-cam videos from South Point and Coal Grove should be available, as well as a more detailed analysis from the Ohio State Highway Patrol of tire tracks, the condition of Caruso’s car, which was not included in the photographs released, and other evidence. 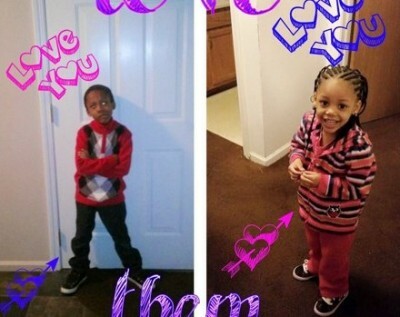 Michaelangelo, 6, and Makiah Jackson, 3, died June 24, 2014 as result of high speed Detroit “Special Ops” chase. Four days before this chase, on June 24 on Detroit’s east side, a similar chase ended with the tragic deaths of children Michaelangelo and Makiah Jackson, 6 and 3 years old, respectively, as they played outside their home. Detroit Special Ops officers Steven Feltz, Richard Billingslea, and Hakeem Patterson chased a Camaro driven by Lorenzo Harris over a lengthy route, according to VOD’s investigation. His car nearly hit other children near Nottingham and Mack, with the police car directly on its tail, witnesses told VOD. The chase proceeded north past E. Warren and Nottingham. There, a witness told VOD said she saw the police car bump the Camaro, sending it out of control into the Jackson children after it hit a large rock in the street, and then into three other children in the next block who were injured. 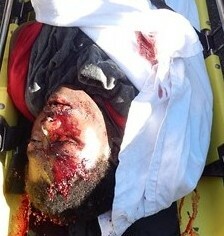 Some of hundreds of Detroit-area people dead at the hands of law enforcement. The alleged bump may have been a “Precision Immobilization Technique,” or PIT, as described by Michigan State Police in another report (see video at end of story). Meanwhile, the families of Aiyana Jones, 7, Terrance Kellom, 19, and Kimoni “Kodak” Davis, 19 are pledging to continue the battle for justice for their loved ones. 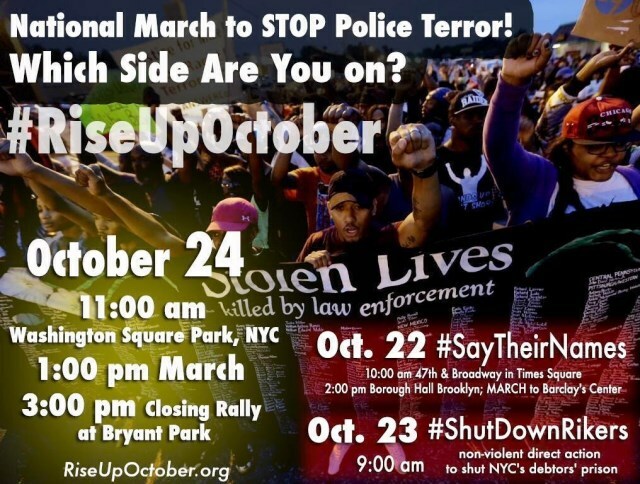 They are to report back to VOD next week after their return from #RiseUpOctober in New York. 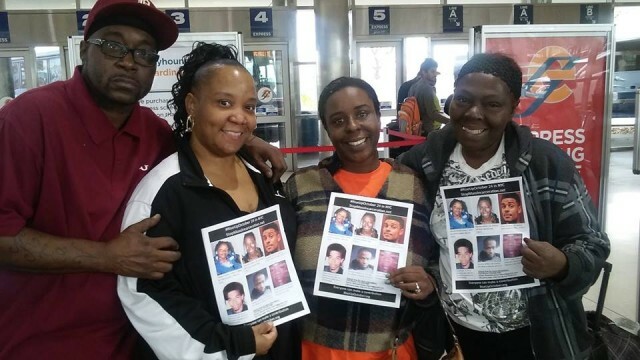 Kevin Kellom and wife Yvette Johnson, Kimberly Griffin and Mertilla Jones heading out for New York City’s #RiseUpOctober events. Photo: Fred Engels. 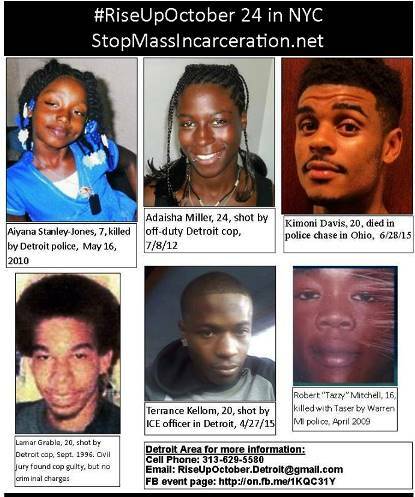 This entry was posted in Uncategorized and tagged AdaishaMiller, AirshaanWarren, AiyanaJones, Beatbackthebullies, blacklivesmatterDetroit, JusticeforMakiahMichaelangelo, KimoniKodakDavis, LamarGrable, PoliceState, PrisonNation, RiseUpOctober, saveourchildren, StandUpNow, StopPoliceChases, TerranceKellom. Bookmark the permalink.